Wooden wine racks are seen as the 'traditional way' to store your wine, they let your bottle sit horizontally so the cork is always wet. You're able to stain the bespoke wooden racks, this is great if you're trying to match a certain decor. Wooden racks are stable, durable and long-lasting so you shouldn't have to replace them any time soon. What is a wooden wine rack? They are sturdy and stable for holding your wine bottle collection. 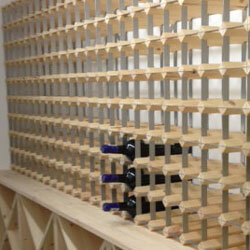 Wooden racks are usually handmade and offer the perfect solution for storing your bottles of wine. Wooden racks are available in a variety of different designs and finishes: oak is an extremely popular choice. Bespoke racking is perfect for commercial use. Shops, restaurants, pubs, bars and wine collectors often require a rack to fit within a certain space. Therefore bespoke racks can be designed to fit in a unique space and hold a large number of bottles. These can be decorated to fit in with any décor; most often they are plainly decorated as they are simply used for storage, for example within a wine cellar. Domestic racks are ideal for use in the home, whether it is a dining room, cellar or kitchen. They are a convenient and cost-effective way to store wine bottles and are available in a variety of shapes, styles and sizes. With this in mind, they are often bought with the intention to match home décor. Domestic racks are available in a variety of designs. How do I choose my wooden rack? High-quality wooden racks are typically made from oak hardwood. These racks are durable and strong; holding your wine bottles securely and safely. How many bottles do I want to store? Where can I fit the rack? Will it match my décor? Do I want a bespoke wooden rack to hold other sizes of bottles, such as Champagne and half bottles, as well as standard 75cl wine bottles? Once you have a clear idea of the type of wooden rack you want and where it will fit (dimensions), you can begin selectign a suitable rack. Racking stores wine safely. The temperature, lighting conditions, humidity and movement are vitally important to help wines to mature properly. The ‘traditional wine rack’ option add a classic look to your kitchen, dining room or cellar. Floor racks are a cost-effective way to store your bottles of wine. They allow you to store an unlimited number of bottles. Bespoke wooden racks can be designed to meet all of your needs and requirements. Racks made of wood are timeless pieces. They are stable, durable and long-lasting. They are available in all types of wood with different wood stains. Wooden racks are an additional piece of furniture to your home. The traditional style are easy to move. So whether you are moving house or moving your rack(s) into a different room, wooden wine bottle storage is ideal. The cost of a traditional wine rack differs with the size of the rack and the stain finish (if a finish is applied). It also differs as to whether you opt for normal sized bottle holes or if you choose to have champagne bottle sizes, magnums, halves etc. Your rack is made to your wine storage requirements and therefore the price will reflect your chosen design. Wooden wine racks require very little maintenance. We advise dusting your rack on a regular basis to maintain overall upkeep (and to check wine bottle levels). If connecting kits were used for your rack, regularly inspect these to make sure that they are still tight and connected safely and securely. If you are ordering a large rack it will be supplied in more than one piece, this is due to move ability and transport reasons. It can only be supplied in more than one piece vertically (not horizontally), so there is a height restriction of about 30 bottles. This is due to shipping limitations and anything over 25 bottles high makes accessing the wine bottles difficult. Stable and flat floor wooden racks are ideal for most places, although a slight variation from left to right (or vice versa) is also possible if you require it. A flat wall for these is helpful although a backing baton is recommended for any traditional rack so that it fits nicely on the wall. However, the weight of the wine in the rack will add to its stability, preventing it from falling forward. If you are unsure about any of the construction and fitting notes or would like anything explained in more detail then please call us on 01903 786148. Please feel free to browse our wine rack accessories section to help you easily organise and protect your bottles. We highly recommend to our customers that they order wine bottle cellar sleeves or plastic wine bottle neck tags. Price is dependent upon size, stain, bottle size (wine, champagne, magnums or halves). The more bottles the rack holds, the greater the cost. Need help choosing the perfect wooden wine rack? Contact Wineware today! 01903 786148 / info@wineware.co.uk.